by Frank Sherwin and Jeff Tomkins, Ph.D.
Creationists maintain that although new species of plant or animal are constantly discovered, many can be placed within the created kinds that God described in Genesis 1. Sharks are an excellent example. Although today’s oceans are teeming with many unique types of shark—and even more so in the pre-Flood world—they remain sharks.2 Evolutionist Michael Benton states that sharks of the genus Cladoselache are basal, i.e., some of the first sharks to have evolved. Yet, these sharks are “surprisingly modern looking.”3 But creationists are not surprised, however. Sharks were created on Day 5 of the creation week and many died and were preserved as fossils during the Genesis Flood just thousands of years ago. Sharks were created on Day 5 of the creation week & many died and were preserved as fossils during the Genesis Flood just thousands of years ago. When new species of sharks are discovered today, they represent the product of the diversification of the various shark kinds that survived the global flood. While creatures can and do diversify (or “speciate”) within their kind—because they were designed to do so—they never evolve into fundamentally new creatures as evolutionists claim. We don’t observe sharks evolving into other kinds of sea creatures today nor do we see any evidence of a shark transitioning into another type of creature in the fossil record. Sharks appear suddenly in the earth’s oceans and remain sharks. 1. White. W. T. et al. 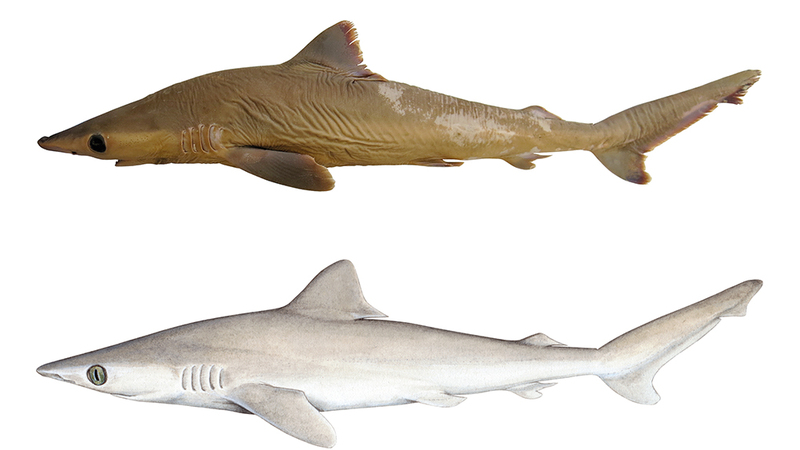 Lost before found: A new species of whaler shark Carcharhinus obsolerus from the Western Central Pacific known only from historic records. Plos One. Posted on journals.plos.org January 2, 2019, accessed January 8, 2019. 2. Sherwin, F. 2013. Shark Origins: An Evolutionary Explanation. Acts & Facts. 42 (12): 16. 3. Benton, M. 2015. Vertebrate Paleontology. Malden, MA: Wiley Blackwell, 173. *Mr. Sherwin is Research Associate is at ICR and earned his master’s in zoology from the University of Northern Colorado. Dr. Jeffrey Tomkins is Director of Life Sciences at the Institute for Creation Research and earned his Ph.D. in genetics from Clemson University.